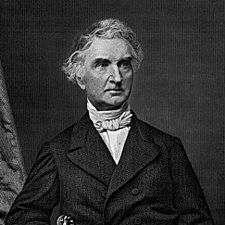 Of the many eminent scientists who, in recent times, indirectly have affirmed the wantonness of slaughtering for human food, the most famous of European Chemists, Justus von Liebig, may seem to demand especial notice. The founder of the science of Organic Chemistry and the method of Organic Analysis (1803-1873), educated at the Universities of Bonn and Erlangen, received his diploma of Doctor of Philosophy (physical and mathematical sciences) at the age of nineteen. Two years later, chiefly by the influence of Humboldt, he was named Professor Extraordinary of Chemistry at Giessen, whither a crown of disciples flocked from all parts of Germany and from England. In 1832 he accepted a Chair at Munich. All the Scientific Societies of Europe were eager in offering him honorary distinctions. It is in his application of his Special Sciences to the advancement of Agriculture, and his more philosophic, though (it must be added) occasionally contradictory views upon the comparative values of Foods, which give him the best title to remembrance with posterity. We can enumerate only a few of his numerous works : Ueber Theorie und Praxis der Landwirthschaft ("Upon the Theory and Practice of Agricultural Economy"), Brunswick, 1824, translated into English; Anleitung sur Analyse Organische Körper ("Introduction to the Organic Analysis of Bodies"), 1837; Die Organische Chemie in ihren Anwendung auf Physiologie und Pathologie ("Letters upon Chemistry considered in Relation with Industry, Agriculture, and Physiology"), 1852. "Vegetable fibrine and animal fibrine, vegetable albumen and animal albumen, differ at the most (höchstens) in form. If these principles in nourishment fail, the nourishment of the animal will be cut off; if they obtain them, then the grass-feeding animal gets the same principles in his food as those upon which the flesh-eater entirely depends. Vegetables produce in their organism the blood of all beings. So that when the flesh-eaters consume the blood and flesh of the vegetable eaters, they take to themselves exactly and simply the vegetable principles. "Vegetable Foods, in particular Corn of all kinds, and through these Bread, contain as much iron as the flesh of Oxen or as other kinds of flesh. "Certain it is, that of three men, of whom the one has fed upon ox-flesh and bread, the other upon bread and cheese, the third upon potatoes, each considers it a peculiar hardship from quite different point of view; yet in fact the only difference between them is the action of the peculiar elements of each food upon the brain and nervous system. A Bear, who was kept in a zoological garden, displayed, so long as he had bread exclusively for nourishment, quite a mild disposition. Two days of feeding with flesh made him vicious, aggressive, and even dangerous to his attendant. It is well known that the vis irritabilis of the Hog becomes so exclusive through flesh-eating that he will then attack a man. "The flesh-eating man needs for his support an enormous extent of land, wider and more extensive even than the Lion and the Tiger. A nation of Hunters in a circumscribed territory is incapable of multiplying itself for that reason. The carbon necessary for maintaining life must be taken from animals, of whom in the limited area there can only be a limited number. These animals collect from the plants the elements of their blood and their organs, and supply them to the Indians living by the chase, who devour them unaccompanied by the substance (stoffen) which during the life of the animal maintained the life processes. While the Indian, by feeding upon a single animal, might contrive to sustain life and health a certain number of days, he must, in order to gain for that time the requisite heat, devour five animals. His food contains a superfluity of nitrogenous substances. What is wanting to it during the greater portion of the year is the necessary quantity of carbon, and hence the invertebrate inclination of flesh consumers for brandy. Quoted in Die Naturgemässe Dätt, die Dätt der Zukunft, von Theodore Hahn, 1859. We may note here that Moleschott, the eminent Dutch physiologist, and a younger contemporary of Liebig, alike with the distinguished German Chemist and with the French zoologist, Buffon, is chargeable with a strange inconsistency in choosing his place among the apologists of kreophagy, in spite of his conviction that "the legumes are superior to flesh-meat in abundance of solid constituents which they contain; and, while the amount of albuminous substances may surpass that in flesh-meat by one-half, the constituents of fat and the salts are also present in a greater abundance." (see Die Naturgemässe Dätt von Theodore Hahn, 1859). But, in fact, it is only too obvious why at present the large majority of scientists, while often fully admitting the virtues, or even the superiority of the purer diet, yet after all enrol themselves on the orthodox side. Either they are altogether indifferent to humane teaching, or they want the courage of their convictions to proclaim the Truth. Among English philosophic writers, the arguments and warnings (published in the Dietetic Reformer during the past fifteen years) of the present head of the Society for the promotion od Dietary Reform in this country, Professor Newman, in regard to National Economy and to the enormous evils, present and prospective, arising from the prevalent insensibility to this aspect of National Reform are at once the most forcible and the most earnest. It would be well if our public men, and all who are in place and power, would give the most earnest heed to them. But this, unhappily, under the present prevailing political and social conditions, experience teaches to be almost a vain expectation.